The Specials are one of the defining bands of the late '70's/early '80's along with Jerry Dammers' iconic label Two Tone Records. Originally formed in 1977, as The Coventry Automatics, The Specials combined Jamaican ska and Rocksteady, mixed with the energy of punk they launched a whole Ska Revival. They also helped likeminded bands such as Madness, The Beat, The Selecter to release their first singles. The Specials released "Gangsters" as their first single in the summer of '79, quickly releasing the classic singles "A Message To You Rudy," "Do Nothing" and "Rat Race." 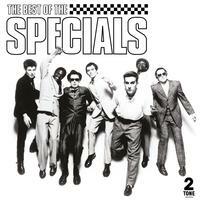 They released their debut album Specials in 1979, followed by More Specials in 1980. During this time, the band has two U.K. No. 1 singles, a live version of "Too Much Too Young" from The Special AKA Live EP and the unforgettable Ghost Town in the summer of 1981. Jerry Dammers continued as The Special AKA following the departure of band members in late 1981, releasing their third album In The Studio which included the iconic single "Nelson Mandela." This 20-track compilation collects all their key singles and album tracks, made available on heavyweight 180-gram vinyl for the first time.